Whether you're measuring out ingredients for a recipe, filling up a car's gas tank or just adding detergent to the washing machine, math and volume come are used often in daily life. From measuring liquids to assessing drinking amounts, volume is necessary. Keep in mind that volume has nothing to do with weight or mass; it is the measurement of how much space a liquid or gas takes up. Mass, on the other hand, refers to the quantity or amount of matter in an object, whereas the volume of a solid can be measured via liquid displacement. One of the main ways volume is used daily is when calculating drinking amounts. Soda pop is bought in 12-ounce cans or 20-ounce bottles. At the bar someone might order a pint of beer. Mayo Clinic recommends people drink a little more than 8 cups of water a day or eight 8-ounce glasses of water, about 1.9 liters. When you fill up your vehicle, the volume of gasoline your gas tank holds determines your purchase. Whether you fill up with gallons or liters of gasoline or other fuels, the amount is a volume calculation. On a smaller scale, when you fill up a gas can to take to another vehicle or to use the gas to power another device, you again use volume for determining the amount needed. 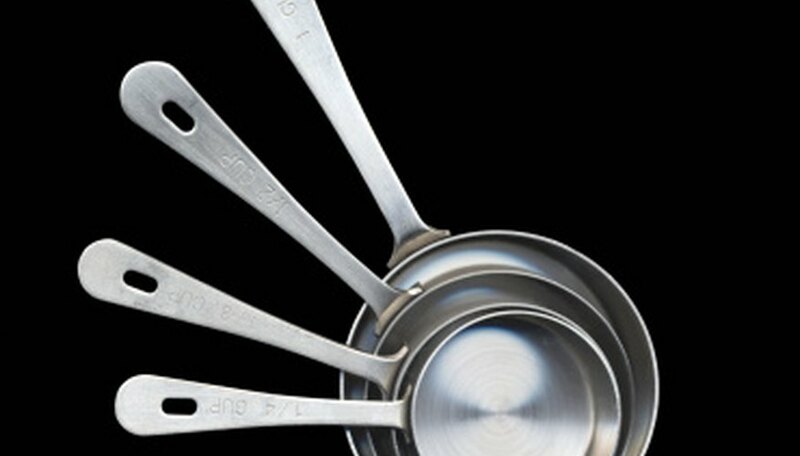 The number of measuring cups and spoons in the average person's kitchen is indicative of how often volume is used when cooking. From the 1/4 cup of oil that is needed in a brownie recipe to the quart of chicken broth that is required for chicken noodle soup, volume is a measurement that is used in almost every recipe. Volume is used in most house-cleaning chores. When washing clothes, you add a specific mount of laundry liquid to the washing machine based on the load or volume of the tub and the clothes being washed. When using concentrated cleaning detergents, you add a specified amount of the cleaner to a clearly defined amount of water. Many times you apply a fixed volume of liquid to whatever you are cleaning. Water volume plays a huge part in water conservation. Water flow from a shower head is figured in gallons per minute. If you take a 10-minute shower, you'll likely use about 40 gallons of water, unless you have a water-saving showerhead. Water flow from sprinklers and hoses to determine water usage and conservation in your yard is also figured in gallons per minutes. Both are volume measurements. Once a pool or hot tub is filled with water, maintenance begins. Detailed volumes of cleaners and chemicals are needed at critical intervals. The volume of chemicals, such as chlorine, are adjusted to the pool's capacity for water. MayoClinic.org: Water: How Much Should You Drink Every Day? Welch, Toby. "Uses of Volume in Daily Life." Sciencing, https://sciencing.com/uses-volumes-daily-life-8692308.html. 14 March 2018.